Named after a 1940’s idea to use lighters (small craft) to carry cargo from congested ships waiting in the harbour, to the nearby wharves, the lighter system had worked well in London but was not to be in Auckland. Double-handling was its downfall. Once used as a landing place for TEAL flying boats at Mechanic Bay, most of the land in the area was reclaimed prior to 1930. Reclamation also included the creation of Victoria Park. You can now walk along Lighter Quay on a series of concrete wharves to Viaduct Harbour and the Voyager Maritime Museum. 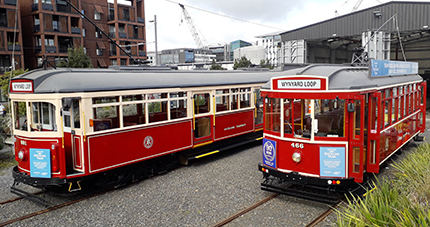 A highlight of the Halsey Street tram stop is the stunning view of the sparkling Waitemata Harbour, easily accessible from a public viewing platform at the Viaduct Events Centre. Many large ships have sailed these beautiful waters over the years including troop ships, the first steam ship Governor Wynyard built locally in 1852, local shipping company Bradney and Binns’ green-hulled vessels running services to Waiheke Island and the trans-Tasman passenger ships of the Union Steam Ship Company. Yacht designing and building is something Auckland is famous for. More recent names include Bruce Farr and Laurie Davidson of America’s Cup fame. It was Davidson’s superb Black Magic design of 1995 that won the cup for Team New Zealand at San Diego. Nowadays the Waitemata Harbour is home to countless privately owned boats, as well as the working vessels keeping our marine industry afloat. No wonder Auckland is known as the ‘City of Sails’. 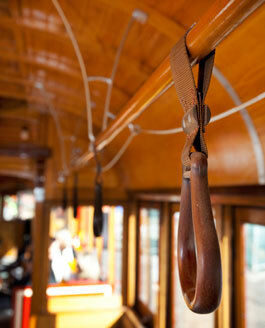 Find out more about the stops and sights you will see along the Auckland Dockline Tram route.